Improper planning, unclear design, and sans a public consultation, the state government’s proposal to build a war memorial at the Indira Gandhi park has irked some Bangaloreans. 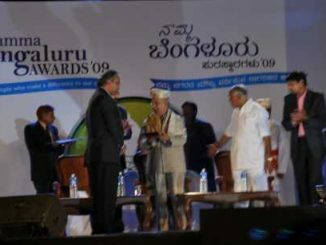 At a glittering ceremony last weekend, a select set of Bangaloreans and Bangalore-based organisations were recognised for their contribution to namma city. This fortnight’s neighbourhood roundup: Jayanagar Academic Committee’s (JAC) goal is to improve SSLC results in Jayanagar constituency; BBMP builds gazebo in JP Nagar park. Janapada Loka, located 43kms from Bangalore is a world of folk culture and art and a must visit heritage site for the inquisitive ones. Madiwala market is on both sides of the road that connects Koramangala and Sarjapur road with Hosur road. The vendors here sell vegetables, fruits, flowers, spices, pooja items, fish and more. Art isn’t elitist or prohibitively expensive always. If you are a newcomer to the art scene in the city, here’s how to find your way around. The state government released the wards reservation list for city council seats on 23 February. The last date for sending objections is 2 March 2010. BBMP’s project to paint the city walls has both supporters and critics. But it has given employment albeit temporarily to more than 60 work banner artists. With fire safety norms openly flouted, is the city waiting for yet another fire accident to occur, before regulations are strictly enforced? Our take on Carlton Towers fire. Never give out hard evidence like photographs or written statements without legal counsel. They could easily be manipulated against you.